American Sniper, starring Bradley Cooper in an Academy Award-nominated performance, took the top spot in Tribute’s top five trailers of the week. Following close was The Wedding Ringer and The Imitation Game. Family film Paddington also scored a spot on the list. Which was your favorite trailer of the week? 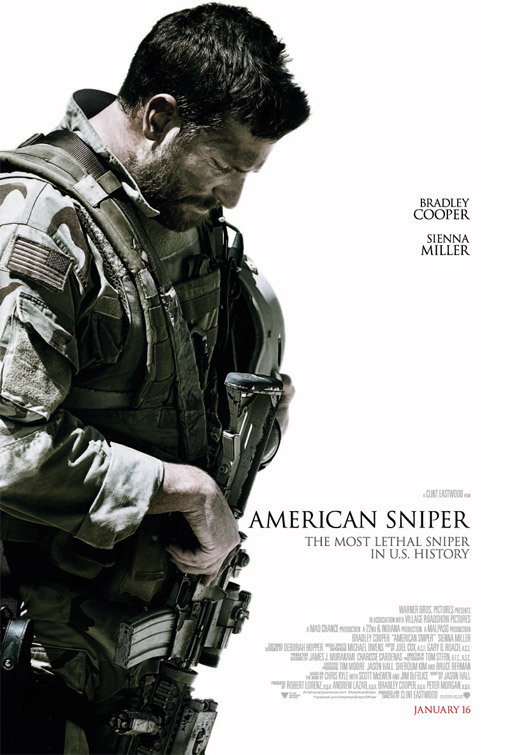 1) American Sniper trailer: Texas native Chris Kyle (Bradley Cooper) becomes a Navy SEAL and during his time in the service, records the highest number of sniper kills for an American—more than 150 confirmed kills. Meanwhile, his wife slowly watches as her husband’s affection turns from her to the SEALS and the war. Based on the memoir by Chris Kyle. 2) The Wedding Ringer trailer: Jimmy (Kevin Hart) provides best-man services for socially awkward guys who don’t have anyone close enough to stand by them on their big day. Doug (Josh Gad), a groom-to-be, has found himself in that exact situation. However, to make things worse, Doug made up names for not only his best man, but his nine groomsmen as well. He seeks out Jimmy’s help to pull off his wedding plans in an effort not to ruin the big day for his bride. 3) The Imitation Game trailer: Alan Turing (Benedict Cumberbatch), a brilliant Cambridge mathematician, cryptanalyst and computer scientist, is enlisted by his country during World War II to break the Nazi Enigma code, and is later persecuted by the government in 1952 for being homosexual. Based on the book Alan Turing: The Enigma by Andrew Hodges. 4) Paddington trailer: A young bear from the jungles of Peru with a passion for all things British travels to London in search of a home. Finding himself lost and alone at Paddington Station, he begins to realize that city life is not all he had imagined – until he meets the kindly Brown family, who read the label around his neck (‘Please look after this bear. Thank you’). They name him after the station and offer him a temporary home, where he discovers that his favorite food is marmalade. However, when Paddington gets into mischief, Mr. Brown is not at all impressed and decides the little bear is no longer welcome to stay. But that’s not the worst of Paddington’s troubles. A taxidermist (Nicole Kidman) spots the bear and decides to stuff him. 5) Taken 3 trailer: Ex-covert operative Bryan Mills’ (Liam Neeson) reconciliation with his ex-wife (Famke Janssen) is tragically cut short when she is brutally murdered. Consumed with rage, and framed for the crime, he goes on the run to evade the relentless pursuit of the CIA, FBI and the police. For one last time, Mills must use his “particular set of skills,” to track down the real killers, exact his unique brand of justice, and protect the only thing that matters to him now – his daughter (Maggie Grace).